The members of the Porkroll Project band are all fans of the Three Stooges. A rehearsal seldom goes by without reciting a scene or two from one of the Stooge classics. At the very least there's a few nyuk, nyuk, nyuk's. In the summer of 2010, we were introduced to the Stoogeum, located outside of Philadelphia in Ambler, PA. The Stoogeum is "the world's first and only museum of Three Stooges memorabilia." It was through the Stoogeum website that we found out about Paul Howard, the son of Moe Howard. Paul is a caricaturist, artist, cartoonist and will create caricatures from photos. It was obvious we needed a band caricature by Paul Howard. After exchanging a few e-mails, photos, and a rough draft or two, Paul created an amazing band caricature that completely captured the "Porkroll-ness" of the band. Check it out! 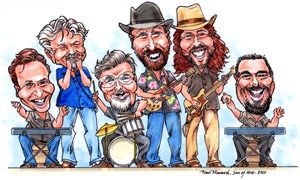 All of us in the Porkroll Project Band want to thank Paul for the great work he did in creating the caricature. Paul was a real pleasure to work with too. It couldn't have been easier. We highly recommend Paul for the quality of his work and the way he works - he's a real pro!